Kiran is an accomplished paranormal researcher. She uses a forensics based research theory investigating some of the most haunted places in the tri-state area. 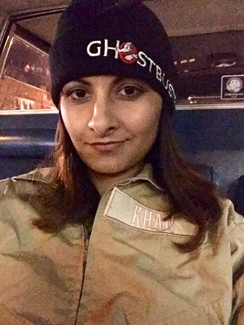 Kiran was last part of years long paranormal project investigating and categorizing the many spiritual inhibitors of Pennhurst Asylum in Spring City, PA. After one too many close encounters with evil spirits and possible demonic presences, Kiran decided she had enough and wanted join a team that was part of the solution in ridding the world of the most evil spirits…The Bureau for Paranormal Research and Defense. When that didn’t pan out she joined Ghostbusters NJ.